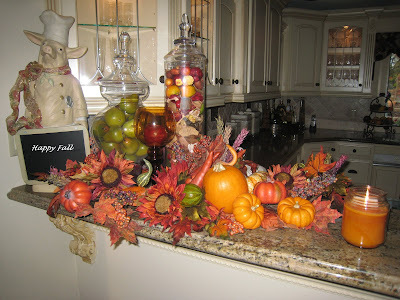 A Fall vignette in my kitchen. I love these swags....Add a pumpkin candle and it's Fall. 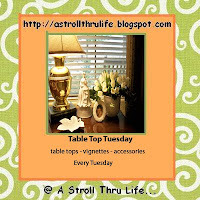 I am joining Marty at Stroll Thru Life for another party. Please visit her and enjoy all of everyone's postings. Don't forget to check out our before and after kitchen photos. 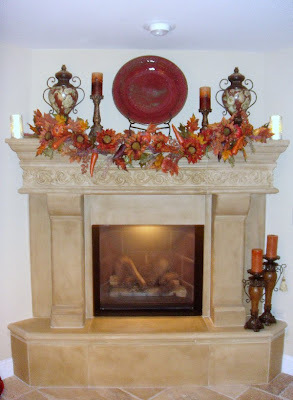 Isn't it fun decorating a mantle? You can change it according to the seasons. Some Fall color in our bedroom. The photo is my sister, Cynthia, who passed away in 2004 and myself. I miss her terribly. She died unexpectedly in her sleep. I love you Cynthia.......Always in my heart. Really like what you did with your countertop in the kitchen, that is just beautiful and so abundant. you have definitely fallercized your home, and it looks fabulous. Thank you for stopping by and leaving the sweet comment. I'm going to start following your blog. I just took a quick look around and your house is spectacular! Can't wait to see more! It surely fall at your house and everything is beautiful and welcomeing.. Thanks so much for visiting me and your kind comment..
Everything is so pretty! You have set a lovely feel to the whole area.